What can I say about this groom portrait? Every so often, everything aligns to help create a perfect shooting situation. This portrait was actually taken in the hallway closet area just before a bathroom. The orange tile and orange covers are actually inside the antique bathroom, while the mirrored door faces the hallway closet. 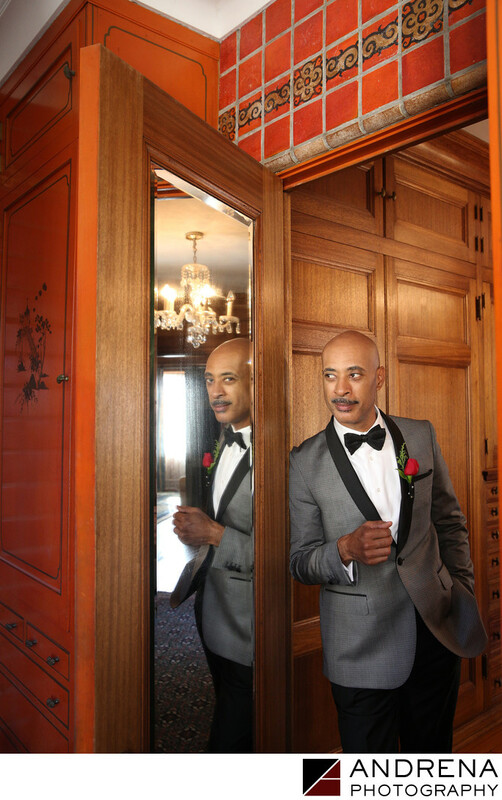 The light streaming through the bathroom windows provide perfect illumination to this groom's face, and the light shining from the windows in the hallway closet area created bounced light off the mirror. The end result was just gorgeous light. Check out this groom's custom-made gray suit, which is swank by any standard. I also love that this groom was good was throwing great facial expressions. Expression can make or break a portrait, so I love when it doesn't take too much coaxing to get just the right look. Wedding photographed at a private estate in Malibu, California.